Raspberry Pi and Arduino are the two main players in the open source home automation area. Being open source, both platforms depend on network effects of developers who will create enough open source projects and who will in turn create demand for consumers. GitHub is the premier code sharing site for developers and most open source projects are shared using GitHub code repositories. 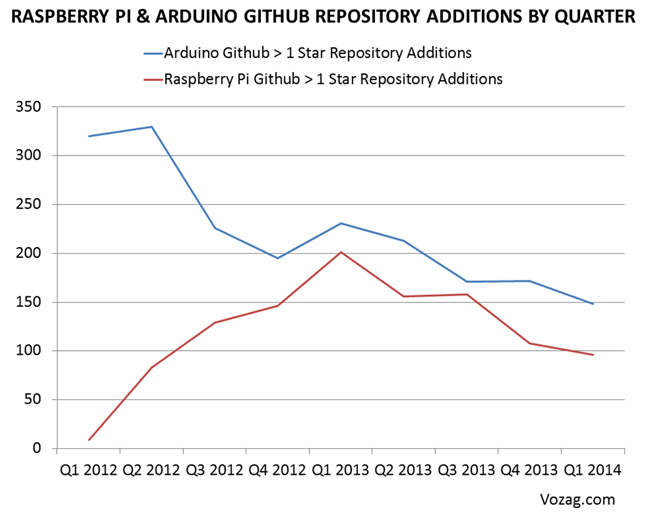 Vozag researched the popularity of Raspberry Pi and Arduino projects with more than 1 star on GitHub. The below graph demonstrates the additions of code repositories for each of these platforms to GitHub by quarter. As the above graph shows, Raspberry Pi began catching up to Arduino in Q4 of 2012 and stayed fairly close to each other after that. Raspberry Pi’s rise has been pretty dramatic especially since it launched only in Q1 of 2012. An example project of Raspberry Pi in the home automation is Heimcontrol.js which has more than 833 stars. The website for the project shows an impressive feature list including a responsive design that allows you comfortable control of your home devices using your smartphone or tablet, access to your home automation app from anywhere in the world and an elaborate plugin system that makes it easy to extend the application with your own plugins. The hardware features for the project include full access to the General-Purpose input/output (GPIO) of the Raspberry Pi, communication with an attached Arduino and streaming to your webcam via socket.io. 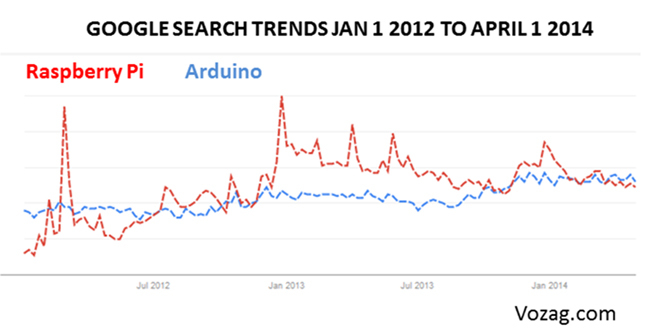 The developer popularity on GitHub is also reflected in the follow-on general consumer popularity which can be seen in Google search trends comparing Raspberry Pi to Arduino. The spike in search trend data at the end of 2012 and beginning of 2013 is closely correlated with GitHub developer popularity shown in the earlier chart. This is an important principle to learn for any platform provider in the open source community. The way to the hearts of consumers is through the love of developers.